After lots of work, it was finally time to turn our pile of parts into an engine. 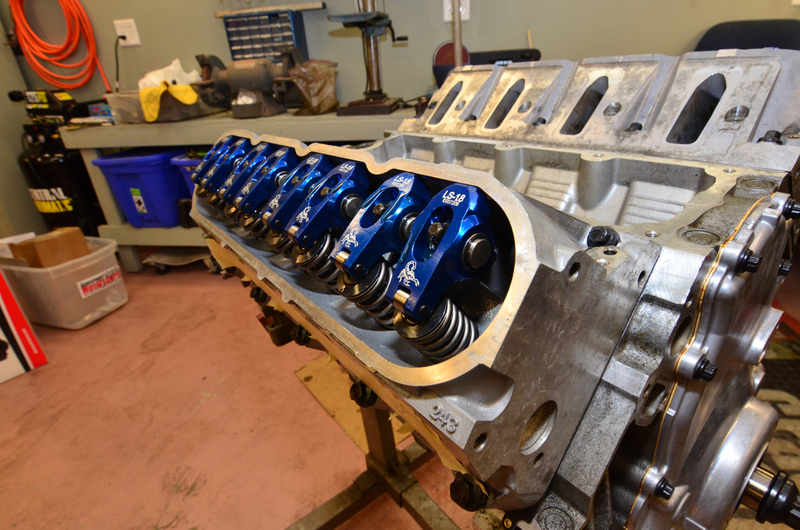 We’d already assembled our Chevy LS1’s bottom end and heads, but now it was time for the fun part. First up: our camshaft, courtesy of Crane Cams. 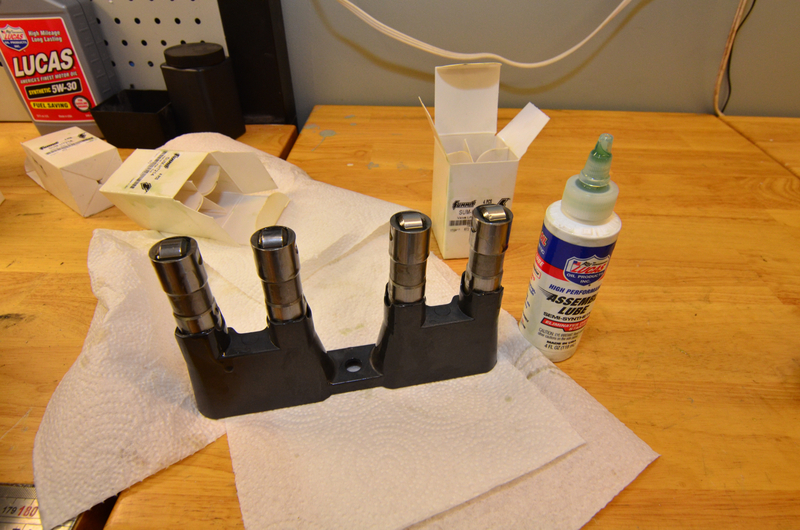 We’d already installed new cam bearings while the bottom end was apart, so installing this was as easy as test-fitting, reaming a few high spots in the bearings, and then slipping it in. Next, time for timing. 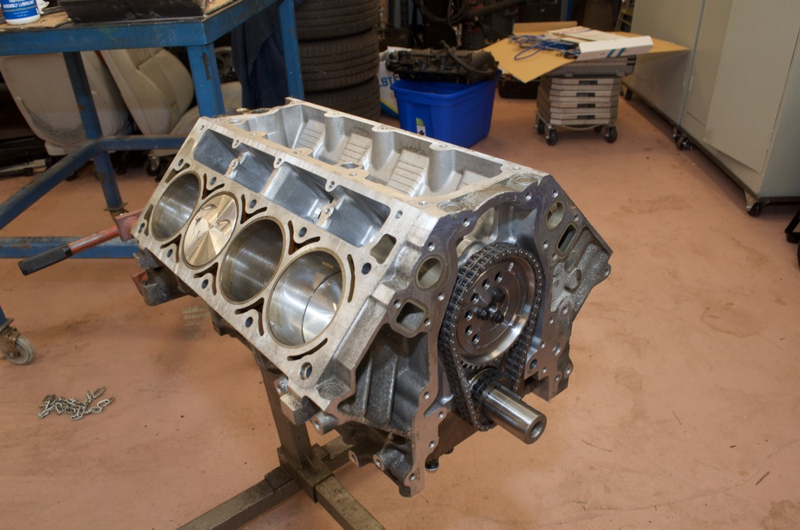 We needed a timing chain and gears to spin the cam, so we chose a double-roller set from Summit Racing. Normal LS1s have only a single roller chain (like a bicycle chain), but by doubling the chain’s width and the gears’ teeth, it makes for a stronger valvetrain. 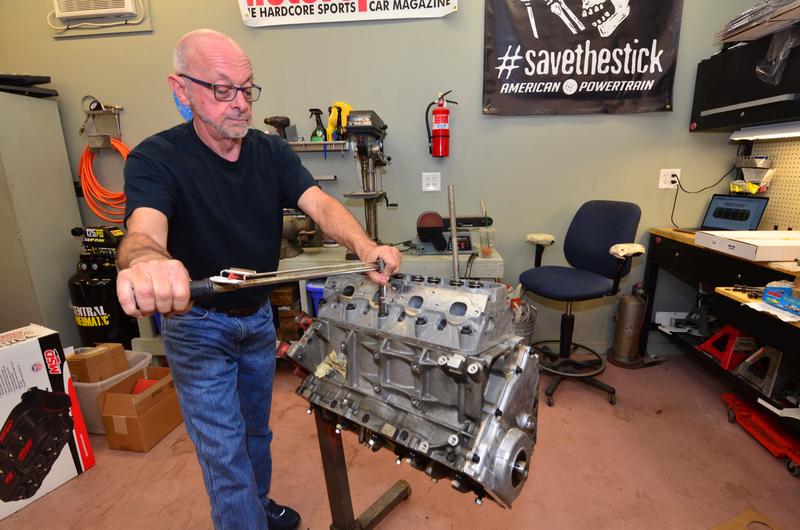 That’s important to us, because we see a future of high-RPMs and stiff valve springs for this engine. 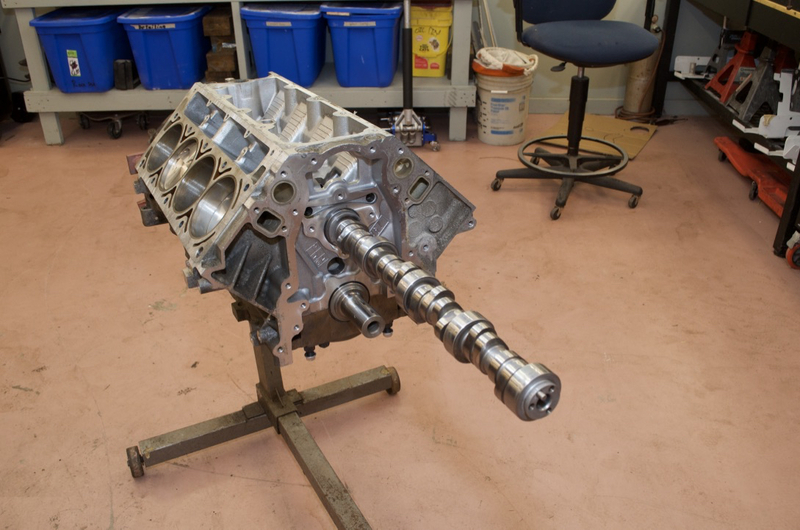 Chevy LS engines use a cam angle sensor, and in order to use a Gen IV electronics package on our Gen III engine, we needed to use a 4x (4-tooth) cam gear to provide the necessary signal to the cam angle sensor we’d be adding in the front timing cover. Gen III engines never had a sensor here, instead relying on one in the back of the block where the distributor would normally be. We’ll be leaving that sensor in, but only to plug the hole: it won’t serve any other purpose with our Gen IV ECU. 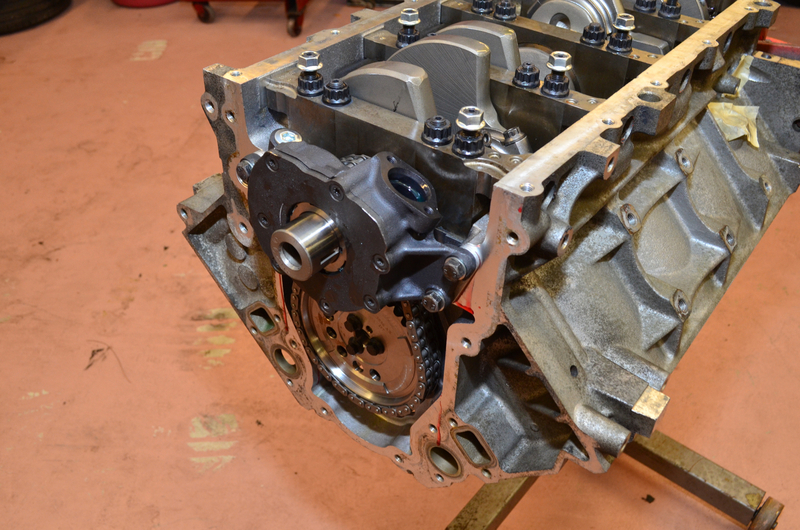 Once we’d installed the timing chain, it was time to add an oil pump. This is driven off of the crank, and sits in front of the lower timing gear. Our double-roller chain came with oil pump spacers, which moved it further forward by about 1/4 of an inch, in order to keep the thicker chain from rubbing the pump. 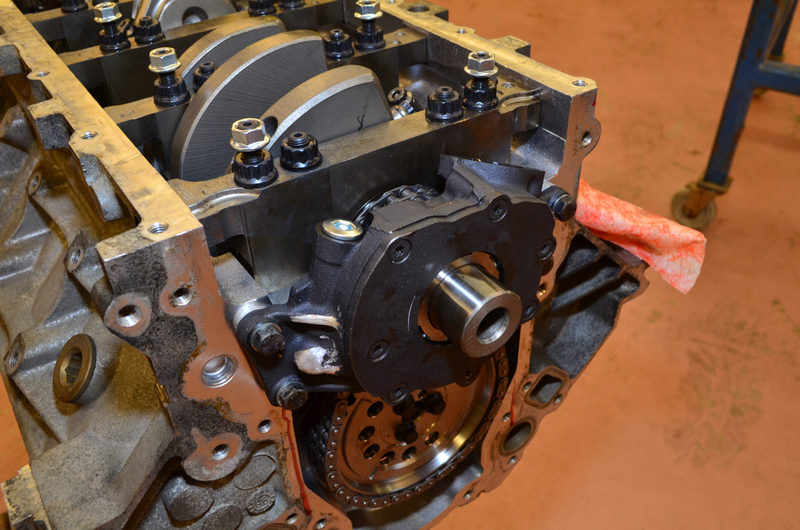 Instead of settling for a factory pump, we instead chose a high-volume Moroso racing oil pump. 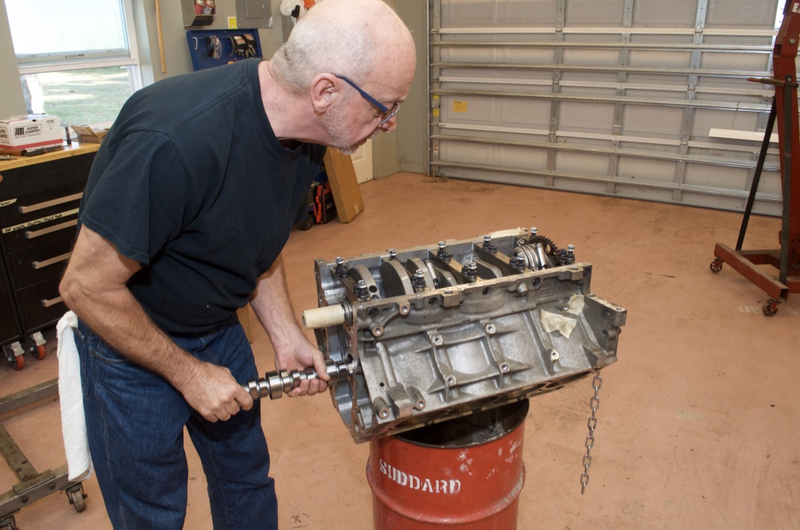 We don’t anticipate an easy life for this engine, so we’re trying to give it as good of bones as possible to future proof it against our bad decisions. 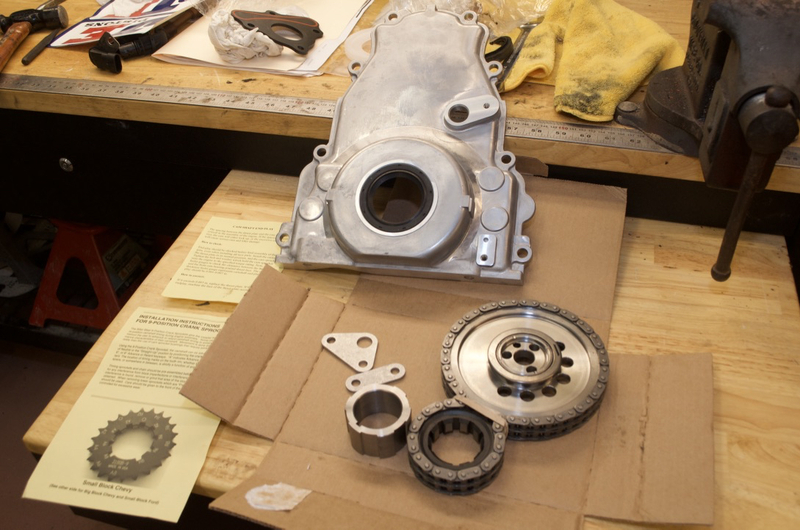 Adding a big oil pump and a big timing set does have consequences, though: We ended up spending almost an hour grinding, removing metal from the oil pump and the timing cover in order to let everything bolt together. And, as we have throughout this project, we bolted everything together with ARP hardware. Quality bolts are great insurance for an engine, and we haven’t skimped on ordering from the ARP catalog. 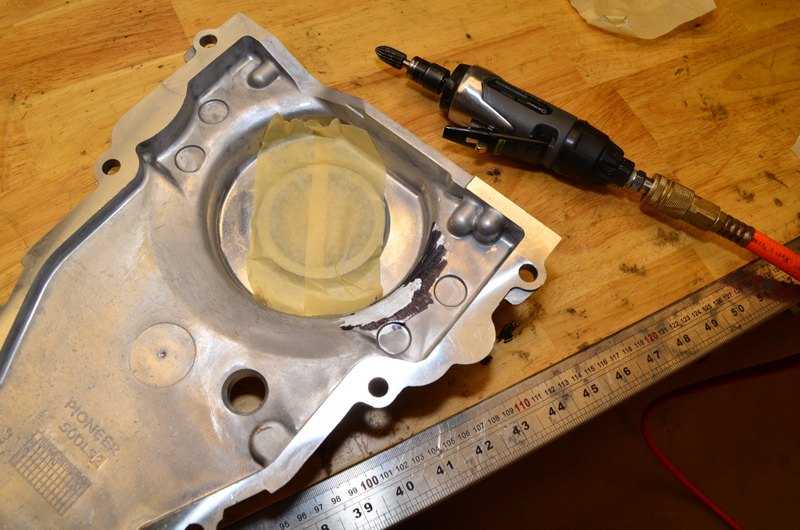 Cam, timing, oil pump: it was time to cover things up. We reused the original rear engine cover, but up front we needed to make a change. 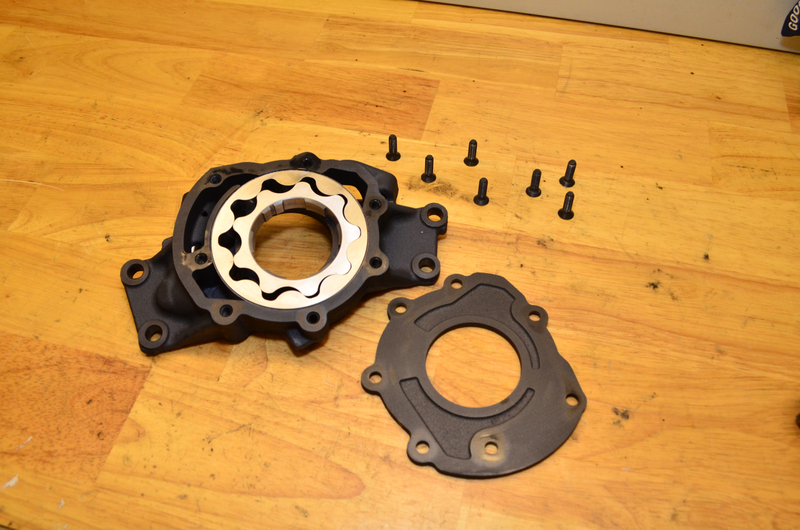 We needed to use a later Gen IV-style front timing cover in order to have a spot to mount that new cam angle sensor. Fortunately, Summit Racing came to our rescue again. They have their own house lineup of timing covers, including the one we needed for our engine. Summit Racing also provided the lifters and lifter guides, the next piece of the puzzle. 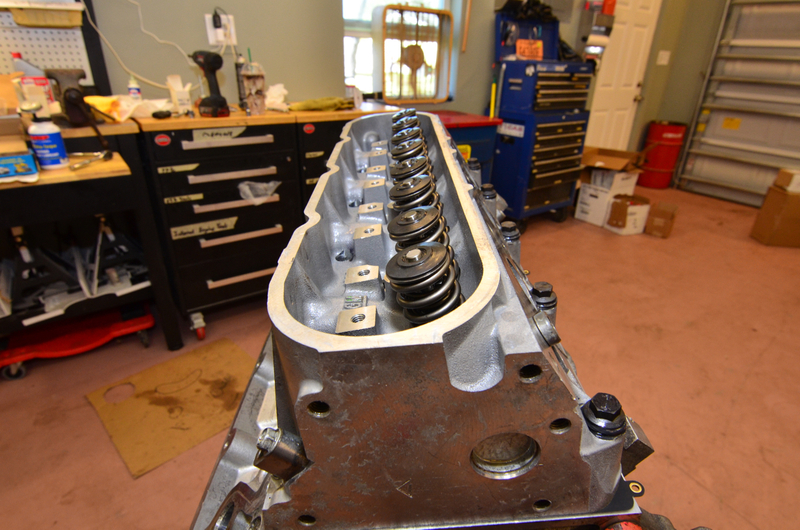 After that came heads, then pushrods, then a valley cover, and finally valve covers. A few plugs, a few sensors, and we were finally done. We’d built our own engine. It wasn’t ready to run yet, though. We still needed an intake, an oil pan and a water pump. We’ll tackle those next. The PO of my '99 FRC is a very good friend of mine and he always asked me about what he should do in regards to modifications. 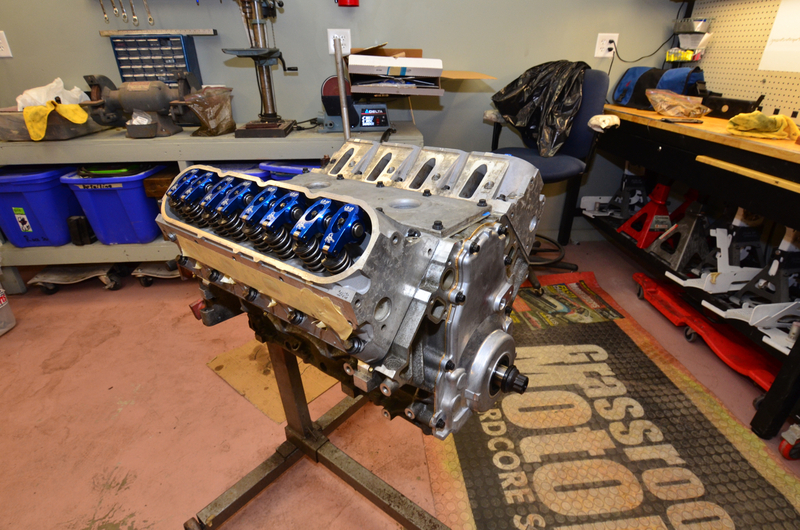 When he had to replace the blown stock LS1 engine a few years ago, the shop setup the Gen III 5.7L LS block with the Manley high pressure pump #10295 due to the vertical clearance on the forged rod beings being sightly wider than stock vs. the 18% higher flow rated but stock pressure Manley #10296 pump. Due to the wider clearances we have to run at least 5w-40 oil as well. They used the LS2 timing chain #12586482, LS2 lifter trays #12596365 and LS7 lifters #12499225. Not sure if this is still the hot lick setup or not, but it seemed to work well at the time and she is still running strong today. One thing to help reduce oil consumption at the track to use the '01-03 LS6 valley cover or even better yet the '04-05 LS6 valley cover and PVC vent tube setup as well as a catch can. 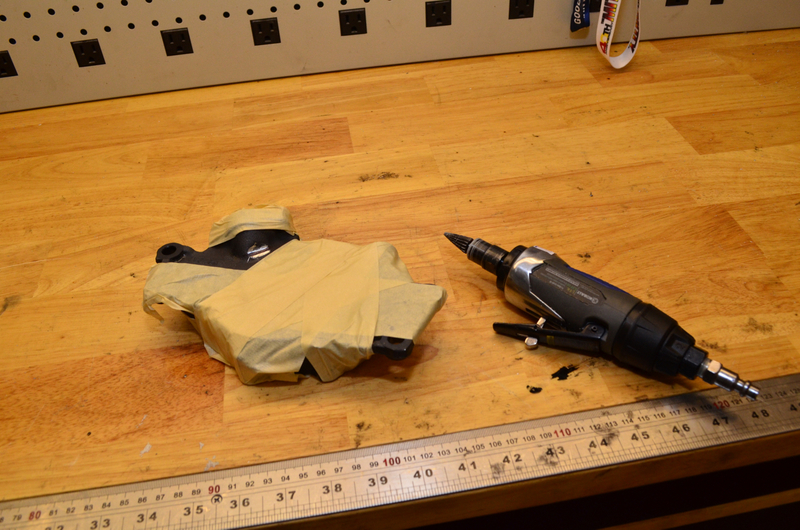 I am using '04-05 valley cover and will add an Elite Engineering catch can setup in my '99 FRC. 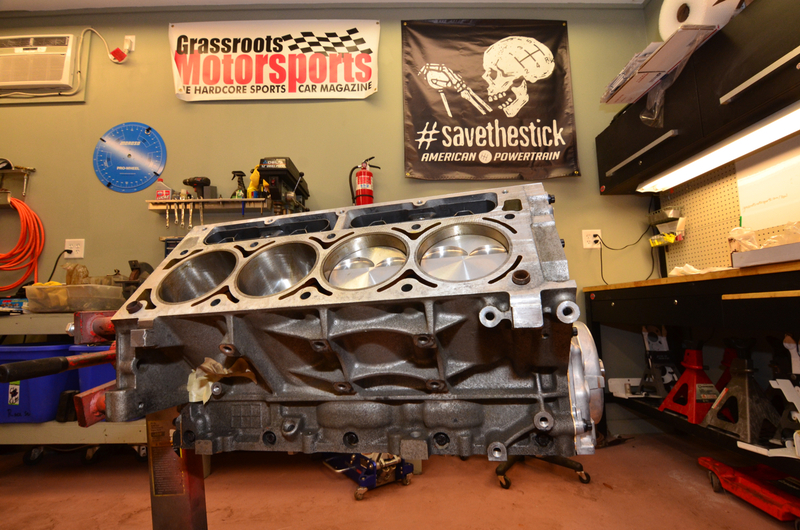 I agree on the LS6 valley cover, but realized it too late–the car still has its LS1 cover on it for now. That may change in the future, though.